"Hello. It's Empties. I was wondering if after all these months you're done using me." Yes. Yes, I am. Finally. At long last, I am done using you & you're officially part of the empties crew. Congratulations. You did it! Now everyone in the world can read about it. 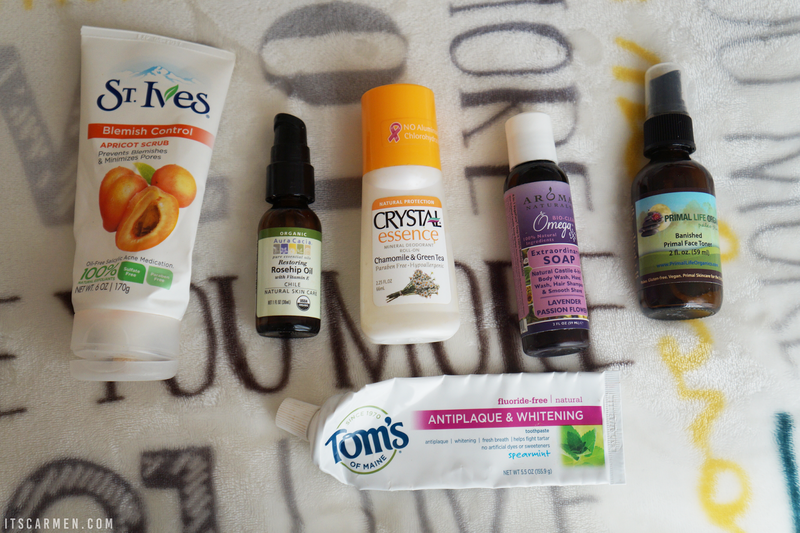 Don't forget to read up on my last empties post Product Empties: Face, Hair, & Body! St. Ives Blemish Control Apricot Scrub - This is a face scrub I repurchase often because it's affordable & it works. It's straight to the point. The scrub is oil free, contains 2% salicylic acid, & is made of 100% natural exfoliants. The apricot scrub leaves my skin feeling refreshed but not overly exfoliated. I might want to try a different brand for my next facial scrub, just to think outside the box. Aura Cacia Organic Rosehip Oil* - I used this organic rosehip oil with vitamin E nearly every morning & night after washing my face. It left my skin hydrated but not excessively oily. I wasn't a big fan of the smell, so I ended up adding about 10 drops of Aura Cacia Lavender Essential Oil to enhance the fragrance. The rosehip oil worked well & it's something I would consider purchasing. Read a little bit more about my Aura Cacia review. Crystal Essence Roll-On Deodorant* - I really like the idea of a roll-on deodorant because it's an easy process. However, after finishing an entire deodorant, I can safely say Crystal's roll-on version wasn't the most efficient. I felt the roll-on didn't protect me from odors; it also went on relatively wet, making me feel a bit sticky. The Chamomile & Green Tea scent smelled positively lovely, but I'd be inclined to try a different all natural deodorant brand to see if it worked better. Find out more in my Crystal Deodorant review. Aroma Naturals Lavender Passion Flower Castile Soap* - If you know me at all, you know I adore lavender & the Aroma Naturals 4-in-one castile soap didn't let me down. This little guy comes in a handy 2 oz. bottle, perfect for travel or the shower. I have no complaints about this, I do admit I only used it as a shower gel. Apparently you can utilize it as a shampoo, hand wash, or a shave soap. 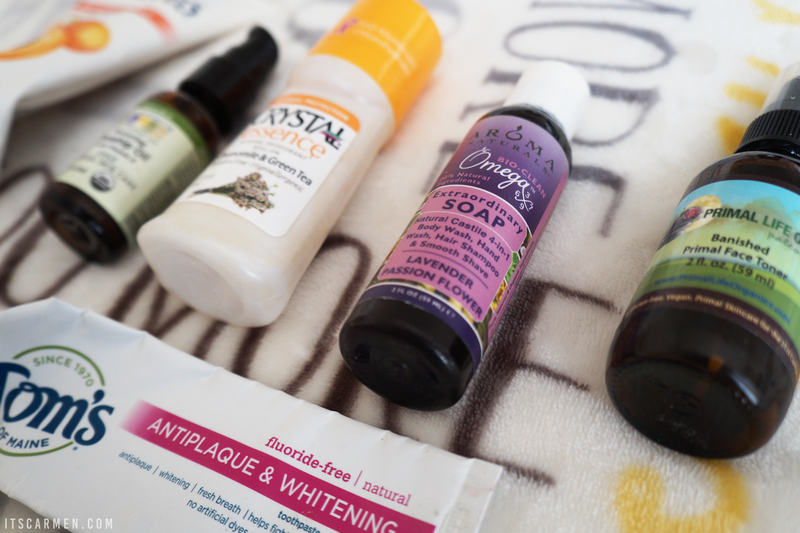 Check out the other castile soaps Aroma Naturals sent me. Primal Organics Banished™ Face Toner* - To be honest, I didn't like the smell of this initially. It took some warming up to, but I eventually began spritzing it on my face every day after cleansing my face & before moisturizing. The retail price is $44 so consider it an investment. I can't say for sure if it did anything for my skin so I doubt I would buy this myself. Find out more in my Primal Life Organics Paleo Skincare Review. 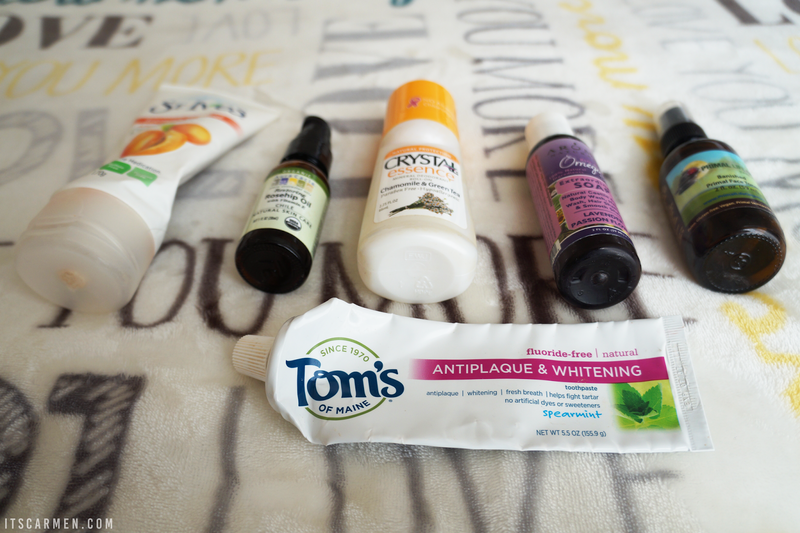 Tom's of Maine Spearmint Antiplaque & Whitening Toothpaste - I always called this brand "Tom's" like the shoes, but didn't realize the full name is Tom's of Maine. You learn something new every day. This empty product is actually my second Tom's of Maine toothpaste & I've already purchased a third one. I try a different flavor or function each time & I dig it. This is my current favorite toothpaste brand. The ingredients are natural & I like that they share what ingredients are used & what the purpose is. If my teeth weren't so sensitive I'd be all over trying that toothpaste, but I'm so afraid that it just won't work for me! The rosehip oil sound amazing! I've been wanting to try one forever. Thanks for sharing your empties! Ahh I definitely need to try the face scrub! Thanks for sharing! Can't wait to try some of these products! Thanks for sharing! great!!! i use st ives and toms too!! thanks for sharing your thoughts! gotta love when a brand discloses its ingredients like the toothpaste brand! I'm so impressed, I rarely can completely finish a bottle! You have me very intrigued by the rosehip oil! I've heard good things about rosehip oil! Good tip about adding the essential oil...I will have to give this one a try! I always feel a sense of accomplishment after finishing a product haha. I've been obsessed with jojoba oil recently, but once it becomes an empty I think I'll have to give rosehip a go! With beauty products, it's so easy to continuously buy without keeping check on what you already have in store. Personally, I love the St. Ives scrub, it's one of my faves! thanks for stopping by and commenting on my blog, so glad to have found yours! and i love this! i use st. ives and rosehip oil as well! i do love the feeling of emptying a product, what a neat way to share this in a post! Haha nice way of starting a post there,alluding to one of my favorite songs.Great one,I love how you've reviewed the products. I really wanted to love scrubs, but overall they hurt my face , so I use regular soup whenever I want to wash my face. I love reading reviews on products - great to hear! Such a cute post idea! I am a huge fan of the face scrub, very effective for its price! St. Ives is a total staple for me too - I'm about to have an empty bottle on my hands myself! One of my favorite face oil has to be Fresh Seaberry oil! The oil smells amazing. I add two drops to my moisturize and I notice my skin isn't as dry, especially when it is cold in NorCal.